The weather has been up for grabs during January and is been cold. As far as I’m concerned, I’m ready for warmer weather, warm water, and getting out of the house. For those who love to fish open water and want to get away from the ice and snow, one place where you can go is southern Illinois. And it’s only a bit more than four hours south on I-57 so it could be for a couple days or a long weekend if you’re a Chicago southsiders like me. With all of the lakes there being open, there’s one that is on my list to fish right now. Lake of Egypt south of Marion is a southern Illinois power plant lake. With the water being used to cool down the power plant, the discharge gives off some warm water that makes this lake a bit warmer than others in the area. For all of us in northern Illinois, we think of a power plant as a huge body of water that is perched above the surrounding terrain. We also think of it as have nothing but rip rap shorelines and absolutely no scenery at all. That’s not the case with Lake of Egypt. Lake of Egypt is a 2300 acre pond that has nearly 95 miles or shoreline and an average depth of about 20 feet. Having many beautiful home sites on the shores of Lake of Egypt, you can also enjoy the natural beauty where the lake shores up to the edge of the ShawneeNational Forest. Egypt offers a vast assortment of fishing possibilities. My favorite there is casting for bass. Early on in the year, the weeds are down in the back bays of Lake of Egypt. This means that by boat you can access most all of the lake and get back into those little pockets where some huge lunker bass hang out. Some bays get a bit weed choked during warm summer months. I have a couple of favorite baits for catching bass at Lake of Egypt and that’s because they both have caught some monster largemouth bass for me. A white spinnerbait with a single or double willow leaf blade works just great on the bass. The willow leaf blade allows the spinnerbait to spin through and around the weeds with no problem of hang ups. As the spring moves on, the weeds will get thicker and thicker in the back bays. They will actually get to the point that boating access will be near impossible. But for now, this is the lure and the back bays are the places to go. One local rule you must remember when fishing Lake of Egypt. There is no casting of lures within 10 feet of docks, boats or boat houses. This really makes flipping of jigs and plastics under docks out of the question. This shouldn’t discourage you from working areas that are beyond the ten foot rule. Actually all of the bass that I’ve caught there came from small pockets of weeds that lay just off the docks and boat houses. Working the spinnerbait around the sides, over the top and right through the weeds will coax a big one to jump on it. My back up lure for Egypt is really my northern Illinois go-to bait when things get tough. I love using a wacky worm. If the bite is slow I’ll use a smaller worm, like about 3 inches long. On a decent bite, I’ll move up to 4 or 5 inch worms. Use a light jig or if the worm is heavy, us just a wide gap hook. In February and March, there’s really no need to get out at the crack of dawn to catch the bass. Getting on the water at 8 or 9 AM is fine. I love it. With the special snow goose season that runs through March in southern Illinois, anglers who enjoy hunting as well, can hunt in the morning and then hit the water in the afternoon. For the readers that live within an hour or two from Lake of Egypt, I’m confident that you’ve fished this lake once or twice before and it's one of your favorites. But for those who are up north, give this lake a try just once and it will become a lake that you’ll want to fish again and again. There are numerous destinations where you can hang your hat for night or for the weekend. Accommodations are available throughout the area and so many of them you can park your boat and trailer overnight with no problems at all. For some help on that, visit the Williamson County Tourism Bureau website at www.visitsi.com. 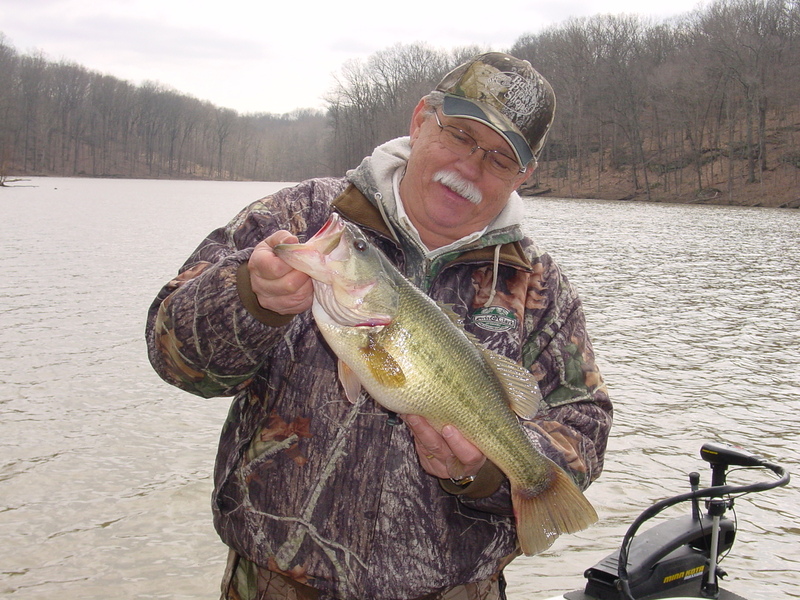 They also have updated weekly fishing reports posted there. You can also give them a call at 800-433-7399. For accommodations assistance a bit further north, Franklin County Tourism has many possibilities for you and with Lake of Egypt being about 40 minutes away, many other great lakes are open for you to explore. From north to south you have RendLake and Crab Orchard for example. Franklin County Tourism Bureau’s website is www.FCTB.com and their toll free number is 800-661-9998. The srevices of these two southern Illinois toursim bureaus can help you enjoy your stay and its all free. The bass fishing in southern Illinois is great and it’s happening right now. Being about four hours away from Chicago’s south suburbs, Lake of Egypt proves that great fishing is not that far away. When you get there, don’t be surprised if you see my boat on the water.